Carl Lind is a management consultant, with a focus on strategic planning, leadership coaching, and the development of profitable growth. Clients have included Ingersol Rand, Tyco, WEB Industries, and The New England Suppliers Institute. Prior to launching his consulting business, he had more than 30 years of leadership responsibility in manufacturing management, concluding with the responsibility of Vice President of Operations at Neslab Instruments (now a division of Thermo Electron). 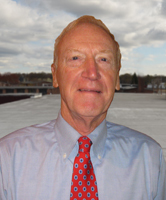 His earlier years were spent at several technology companies including, Texas Instruments, Analog Devices, and The Foxboro Company. He received a BA in Engineering Science from Dartmouth College and an MBA from Harvard Business School, where he was a coauthor of the book, “A New Approach to Physical Distribution.” His military service included two years as an Army ordinance officer in Germany. Carl has served as church chairman, member of the church senior pastor search committee, board member, and treasurer of Pilgrim Pines Conference Center in Swanzey, NH, board member of Children’s Home of Cromwell, Connecticut, and board member of Sturdy Memorial Hospital. He is currently Chairman of the Board of Directors of WEB Industries, Inc. He and his wife Diane have three married children and six granddaughters.